That goes both for IT buyers making decisions about technology and clinicians not getting "bamboozled" by questionable data science, experts said at the Precision Medicine Summit. Artificial intelligence holds huge promise for the advancement of precision medicine. Indeed it will be essential for the data-intensive techniques of personalized care are to gain the traction most are hoping for. 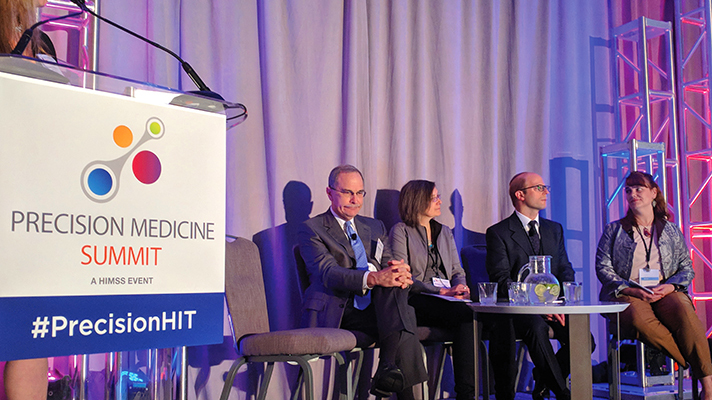 But AI must be approached with caution – by clinicians and IT decision-makers alike – experts said at the HIMSS Precision Medicine Summit on Thursday. From a population health perspective, Richard Milani, MD, chief clinical transformation officer at Ochsner Health System, pointed to a condition such as diabetic retinopathy, which affects large percentages of diabetics if left untreated. The key is getting screened so it can be detected, but too many patients don't make appointments with their physicians, citing lack of convenience. The FDA's approval this past month of IDx-DR, a new AI-based software that can apply algorithms to retinal camera scans for more convenient diagnosis, allows for an easily distributable tool to that can be used by an array of providers who may not necessarily be eye care specialists. That's a promising, well-vetted application of AI for personalized treatment that can be scaled across patient populations, said Milani. Indeed, the FDA itself is excited for the prospects of similar AI tools; in comments earlier this month Commissioner Scott Gottlieb, MD, said the agency is "actively developing a new regulatory framework to promote innovation in this space and support the use of AI-based technologies." On the other hand, many technology vendors out there are making big promises about their own products' AI capabilities – promises that don't always hold up to scrutiny. For CIOs and other IT decision-makers, it's caveat emptor, said Milani. A healthy dose of skepticism is warranted. "Just yesterday I was approached by a vendor making a lot of incredible claims about their product, that it could do this and predict that," he said. "And I'm going, 'Y'know, I read a little bit. It's not like I was born yesterday. This doesn't sound believable to me. Can you send me your proof? The fact that you're claiming this is great. But show me where it's been published in peer-reviewed journals.' And nothing came." For all the excitement around AI and precision medicine, "we have to have a level of scientific rigor before we just start throwing these things out to the population," said Milani. "We just have to do our due diligence in terms of making sure this has been validated in multiple systems." But even when artificial intelligence applications can actually do what they promise, and are working well in clinical settings, hospitals using the tools should still sometimes approach them with a sizable grain of salt. Data analytics are evolving at a rapid pace, after all, and clinicians may not always be familiar enough with the way AI is being deployed to ask the right questions. "At the provider level, one of the things we're trying to figure out is how much data science do you need to teach a medical student to be able to talk to a data scientist?" said Adam Dicker, chair of Department of Radiology Oncology at Philadelphia's Thomas Jefferson University. "For a lot of the algorithms that underlie machine learning, there's a fair bit of statistics," he said. "And for those people who want to get into the weeds a little bit, if you don't understand the process, you really can be bamboozled." Because AI and machine learning are so hyped and often over-hyped, Dicker said the trick is to figure out what actually helps and what does not. Nevenka Dimitrova, chief technology officer for oncology informatics and genomics at Philips Healthcare, agreed that hospitals and health systems need to develop well-defined approaches to how they're going to put the data from AI-driven precision medicine projects to work. "Cognitive overload" is a real phenomenon for physicians, and at Philips a lot of time is spent thinking about usability of genomic data, "the font and the size and the numbers and what layers and what sequence we put in front of clinicians," said Dimitrova. But on a more basic level, "very few health systems that I have seen and talked to have figured out their data strategies," she said. "Many of them, when you talk to them at a CIO level, you see how isolated some of these application are," said Dimitrova. "The two apps don't talk to one another, or there are a couple people who export data from one and import data to another. There's an enterprise data warehouse that gets replenished maybe every 24 hours, but then there are updates that may or may not make it there." When it comes to AI algorithms and analytics, "it's wonderful, it's engineering and science," she said. "But the reality of the data strategy needs to be figured out first."